Each with different run lengths from 500 to 9999 copies. 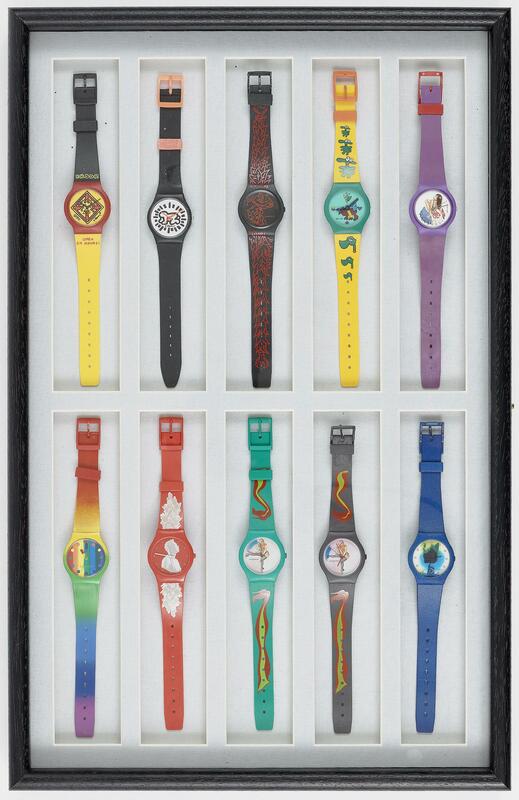 Included are watches by the following artists: Mel Ramos: 'Miss CHAOS' (2 copies), Jiri Georg Dokoupil: 'Rainbow', Otmar Alt: 'Froschkönig' (2 copies), Jorg Immendorff: 'La Paloma', Allen Jones: 'Play the Time' (3 copies), Kazuo Katase: 'Nightwatch', Jeff Koons: 'Eternal Koons', Keith Haring: 'Running Time' (2 copies), 'Baby' (2 copies), 'BRDDR Open 24 Hours!' (2 copies), Friedensreich Hundertwasser: 'Kunsthaus Wien', Staeck Edition A.R. Penck, 'Animal Watch', and 1 Coca-Cola watch. Including: 2 watch display cases. All watches are signed in print on the dial, on the back or on the strap and numbered consecutively on the case.